Initiatives to bring peace to chaotic Libya grew apace in the first quarter of 2015. Stakeholders held several sessions of what are commonly referred to as the Geneva Meetings in January 2015. They later asked to move the talks to Libya, and several envoys from Tripoli threatened to boycott the sessions if their demand was not met. The first such meeting took place in Ghadames, on the western border of Libya, during the first week of February, with representatives from the General National Congress (GNC, the disbanded and self-restituted parliament that is based in Tripoli) and others from the House of Representatives (of Tobruk), which is the parliament elected in June 2014. Representatives from the Tripoli government initially attended, but neither the mainly Islamist Libya Dawn nor the GNC were represented. Tripoli was seen as one united block, but the absence of certain factions from the talks exposed the dispute inside the “Tripoli Camp.” Until then, it was from the “Tobruk Camp” that news of inner conflicts emerged, not from Tripoli. The divisions reached their worst point in March, with the sacking of Tripoli’s prime minister, Omar al-Hassi. A truce was announced after the Geneva Meetings, but it was not respected; sporadic and sometimes sustained attacks occurred on both sides. 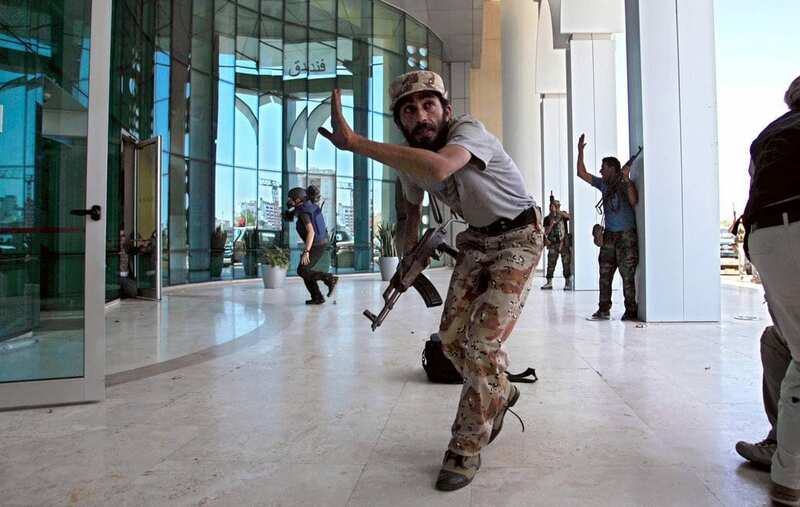 Divisions deepened inside Libya Dawn after the truce was announced, as the most radical elements, who were already hesitant about the meetings, rejected the deal. The Geneva-Ghadames talks were supposed to be moved to Ghat, in southern Libya, but it was then decided that they should take place in Skhirat, in Morocco, backed by the European Union. Algeria hosted another round of discussions, bringing together politicians and fighters. It was backed by the Arab League. Egypt assembled tribal leaders, but the meetings were one-sided (pro-Tobruk) because of Egypt’s involvement in the conflict on the side of the Tobruk Camp. Another round of talks, between municipal leaders, was organized in Brussels at the end of March. The effect of these talks remains limited on the ground, and terrorism is expanding. The new year started out under the banner of Islamic State (IS). Present in larger numbers than ever, the extremist group increased the number of its attacks, targeting the forces of both Tobruk and Tripoli. On 26 January, the Corinthia Hotel, Tripoli’s most important tourist facility, was attacked by two suicide bombers, leaving a dozen dead. IS claimed the attack. Bombings and shootings occurred in Misrata and Tripoli, especially attacks against foreign embassies, namely, those of Iran, Algeria, Morocco, and South Korea. IS was suspected. In fact, the Islamic State had entered the eastern city of Derna. Returnees from Syria joined forces with local extremists and pledged allegiance to the self-proclaimed caliph of IS, thus becoming IS in Libya. Their declared enemy was the government of Tobruk, which is recognized by the international community, and the forces of General Khalifa Haftar, but the Corinthia attack made it clear that they had added the Tripoli coalition to their list. Sirte, Gaddafi’s coastal hometown, which lies in Tripoli’s zone of influence, became a battleground between IS-affiliated groups and others related to Libya Dawn. Assassinations targeting security forces in the city increased in January. In mid-February, the extremist group beheaded 21 Egyptian Copts on Sirte’s coast, provoking international outrage and Egyptian air attacks on IS targets. On 20 February, three suicide attacks targeted the eastern city of Qobbah, leaving more than 40 dead. IS claimed that massacre as well. IS also staged repeated attacks on oil fields on the Mediterranean coast and further south. IS’s slogan “staying and expanding” is apparently being realized in Libya, while politicians continue to fight their little hit-and-run wars. The main issue remains the conflict between military and civilians. Increasing terrorism makes it more difficult for political voices to be heard. Fighters have taken the lead. Tobruk Prime Minister Abdullah al-Thani visited Benghazi in the first week of February, but his convoy was stopped by Haftar forces: the rogue general wanted to be recognized as a leader, not as a puppet. Haftar was finally appointed head of the Libyan army by the Tobruk parliament on 3 March. In Tripoli, Hassi was pushed out by the end of March. Divisions between the fighters of Misrata and the Tripoli-based politicians reached a dead end, especially as peace talks accelerated. Armed radicals believe that they can win with their arms, without resorting to the concessions granted by moderate politicians. As national dialogues multiplied, military action increased, with an unprecedented number of bombings of airports and oil ports/terminals. Haftar began a major attack on Tripoli in mid-March, similar to his assault on Benghazi in October 2014, which failed. Libya is meanwhile becoming a huge arms market, with more than 20 million weapons circulating in the country . It is an oil producer in decline, pumping less than 300,000 barrels per day, with losses estimated at more than $60 billion . In mid-January, the Arab League announced that its member states would be allowed to arm the Libyan army. Algeria declined to take part, and Egypt is apparently the only country to have stepped in. However, frequent visits to Jordan by representatives from Tobruk (e.g., Thani and Haftar) and their subsequent statements may indicate possible future military cooperation. Egypt, on the other hand, retaliated for the killing of its 21 citizens by carrying out airstrikes in Derna. Hundreds of Egyptian workers later fled Libya; the number of Egyptian workers in Libya is estimated to have decreased by 80 percent. Egypt wanted the Arab League to raise an international coalition and intervene in Libya, but Qatar refused. Public exchanges between Egypt and Qatar pushed the latter to withdraw its ambassador from Cairo. By the end of March, Egypt had conducted large-scale military drills near the Libyan border, and a ground intervention is possible. The effects of the Libyan war were felt in Tunisia: the attack of 18 March on the Bardo Museum, which left more than 20 dead, was the work of two Libya-trained militants. Several weapons caches were uncovered near the Libyan border, and many terrorist acts with links to Libya have recently been foiled. Political instability on the Libyan side is also making life difficult for southern Tunisian businessmen and smugglers, who make their living in the Libyan market. This is fuelling Tunisia’s social unrest. Bernardino Leon, the United Nations envoy, requested a sea embargo on Libya, and Italy took the initiative of patrolling the Libyan coasts in March, but the international community remains cautious and somewhat uninterested in the fate of Libya. Libyan stakeholders themselves are busy with their political calculations, while IS is expanding. In between, more than one-third of the 6 million Libyan population has been displaced internally or has fled the country, with more than one million in Tunisia and hundreds of thousands scattered between Egypt and the rest of the world.